Zenit St Petersburg have been sanctioned with a 3-0 loss after their match against Dynamo Moscow was abandoned because of a pitch invasion. 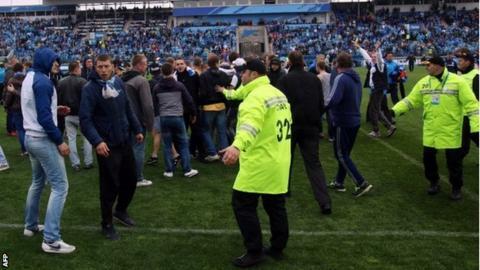 Zenit were 4-2 down when home fans ran on to the pitch, with Dynamo captain Vladimir Granat punched in the head. The Russian Football Union (RFU) has also ordered Zenit to play their next two home games behind closed doors and fined them $28,000 (£16,600). Sunday's defeat was their first under ex-Tottenham boss Andre Villas-Boas. The loss could cost Zenit the title as they now lie a point behind CSKA Moscow with only one game remaining. "Zenit were penalised with a technical 3-0 defeat for their inability to secure public order at the arena and for their fans' assault that forced the game to be abandoned," said RFU disciplinary panel chief Artur Grigoryants. Last season Zenit were handed another 3-0 technical defeat at Dynamo Moscow after a firecracker thrown by one of their fans injured Dynamo goalkeeper Anton Shunin. Zenit also received a $35,000 fine and were ordered to play two top-flight matches behind closed doors.